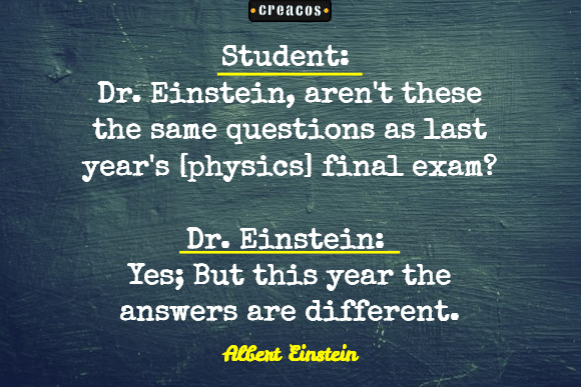 This creativity quote from Albert Einstein is hilarious! Imagine a student's perplexed expression in the examination hall, with last year's question paper in his hand. Generally students ignore the last year's questions while preparing, thinking these won't be repeated. Answers have changed this year! Now, jokes aprt, that is so apt for the events happening in our own times. The world is moving fast, new paradigms and innovations are emerging all around us. Not just in the technology world, but in our approach to life as well. With these new resources, we can surely find new and better answers to old problems. Even the problems which couldn't be answered earlier. That's the creative mindset. To update and upgrade ourselves continuously. To learn new things. To apply what we learn to improve things in our life. Not to be satisfied by old answers. And that will keep our thinking fresh, and Einstein like. PS: There is another version with an assistant asking the question instead of a student. The lesson remains the same.